Dr. Moore is a Professor of Otolaryngology - Head & Neck Surgery and Co-Director of the Center for Cranial Base Surgery at the Emory University School of Medicine. He is also the Chief of Service Otolaryngology - Head & Neck Surgery at Grady Memorial Hospital. The focus of his research is on the investigation of factors involved in disparity of healthcare, with a particular focus on head and neck cancer incidence in medically underserved communities, including a special interest in health equality. Dr. Moore contributes to the research of craniomaxillofacial trauma and anterior cranial base tumor pathology. Dr. Moore has numerous Honors, Awards, and Professional Memberships. Dr. Ewa Szumacher is Associate Professor in the Department of Radiation Oncology University of Toronto, Canada. She is affiliate scientist in Evaluative Clinical Sciences, Odette Cancer Research Program, Sunnybrook Research Institute. She is an academic coordinator in Medical Radiation Sciences Program, Department of Radiation Oncology UofT. Her research focus is to understand patient preferences for radiotherapy treatments across different treatment sites (palliative radiotherapy, breast ca and GU malignancies). Dr. Szumacher aims to improve the care of cancer patients by working together as an interprofessional team in radiation oncology practice. This is achieved by: fostering an interprofessional practice in radiation oncology through continuing medical education (CME), scholarly work and research, developing an interprofessional learning environment and creating modalities for continuing professional education in radiation therapy by organizing interprofessional CME events, investigating interprofessional needs of cancer care providers and trainees. Dr. Clement Gwede is Senior Member and Professor in the Department of Health Outcomes and Behavior, Division of Population Sciences at the Moffitt Cancer Center & Research Institute, and Associate Professor in the Department of Oncologic Sciences, College of Medicine at the University of South Florida in Tampa FL. He has served as Faculty Associate Director for Diversity at Moffitt Cancer Center since 2005, with emphasis on patient diversity initiatives and minority participation in clinical research. Leveraging his training in public health and nursing, his research focuses on reducing cancer health disparities. Supported by grants from the National Institutes of Health (NIH)/National Cancer Institute (NCI), American Cancer Society (ACS), Centers for Disease Control & Prevention (CDC) and the State of Florida Biomedical Research Branch, his current research addresses health equity through culturally appropriate interventions to improve colon cancer screening rates among medically underserved individuals from diverse racial/ethnic and cultural backgrounds. These research studies are heavily vested in cancer education principles, community engagement and use principles of community-based participatory research (CBPR) methods. Dr. Gwede is co-director of the Tampa Bay Community Cancer Network (TBCCN), an NCI-funded Community Networks Program Center (CNPC) leveraging community-academic partnerships to address cancer health disparities through research, training and education; and mentoring students and junior investigators in CBPR methodologies. Dr. Gwede has served on several national committees and peer-review study sections and has published over 90 scientific articles in health promotion, cancer education and cancer prevention and control. Jill Hamilton, R.N., Ph.D., FAAN is Associate Professor at the Nell Hodgson Woodruff School of Nursing at Emory University in Atlanta, Georgia. Dr. Hamilton earned her BSN, MSN, and PhD in nursing from the University of North Carolina at Chapel Hill, a BS in Accounting from North Carolina Central University, and postdoctoral training in the nursing care of older adults at the Oregon Health & Science University. She previously held faculty positions at Johns Hopkins University and the University of North Carolina at Chapel Hill where she was tenured Associate Professor. Dr. Hamilton’s research interests include health disparities, social and cultural factors that influence health, and the coping strategies used among older African American cancer survivors and their families. She has developed measures of coping and spirituality and has conducted research to examine ways sociocultural factors influence how older African Americans use social support and spirituality. Dr. Hamilton is published on topics related to social support, religiosity, spirituality, and quality of life among African Americans with life-threatening illness. She has done original research on the effects of religious songs and verses from Scripture on coping with stress among older and younger African Americans which is published in the Journal of Religion and Health, the Gerontologist, and Nursing Research. Her research on the use of religious songs to alleviate psychological distress when diagnosed with cancer is published in Cancer Nursing. She was a Georgia Cancer Coalition Distinguished Cancer Scholar from 2003-2007 and a member of the 2014 Class of the UNC Thorp Faculty Engaged Scholars. Dr. Hamilton is currently a Fellow in the American Academy of Nursing and a Faculty Scholar of the Center for Spirituality, Theology & Health at Duke University. She was the recipient of the 2011 Oncology Nursing Society (ONS) Publishing’s Division Award for Excellence in Writing Qualitative Research and her work on religious songs was featured in the November 2012 Thanksgiving edition of Good Housekeeping magazine. Eric Vinson is the Program Coordinator at the Northwest Tribal Comprehensive Cancer Program. An enrolled Cherokee Nation member, Mr. Vinson focuses on cancer issues in Northwest American Indian and Alaska Native (AI/AN) communities. His work has concentrated on financial and educational resources available to cancer patients and caregivers; educational interventions to address the issues of cancer in Northwest American Indian and Alaska Native communities; and health care provider trainings to increase capacity of Indian Health Service clinicians. He coordinates NTCCP's Tribal Cancer Minigrants, supporting Northwest Tribes to reach community members through innovative educational venues such as a cancer education program provided for men at a tribal golf event. Mr. Vinson's current work focuses on AI/AN survivorship and includes projects on patient documentation and primary care clinical systems use of cancer treatment summaries and survivorship plans. He is the recipient of: research awards from the US Navy and Army; and Harvey Mudd College Chemistry Department Award for Extraordinary Service to its Students and Faculty. Dr. Cueva is an Assistant Professor of Public Policy and Health at the Institute of Social and Economic Research at the University of Alaska Anchorage. She is also a CDC/CSTE Applied Epidemiology Fellow working with the Alaska Division of Public Health, and Associate Faculty with the Center for American Indian Health at the Johns Hopkins Bloomberg School of Public Health. Her research interests include social determinants of health in the circumpolar north, culturally appropriate health promotion and healthcare delivery, community based participatory action research, and health equity. Dr. Cueva is a co-investigator on a National Cancer Institute award with the Alaska Native Tribal Health Consortium to develop, implement, and evaluate culturally relevant online cancer education with Alaska's community health aides/practitioners. She currently serves on the executive council of the American Indian, Alaska Native and Native Hawaiian caucus of the American Public Health Association. Her numerous awards include the R. Davilene Carter Presidential Prize for best submitted manuscript, the Selma Morris Memorial Travel Scholarship for "exceptionally promising work in global cancer education," and the Dr. Fang Ching Sun Memorial Award "for a demonstrated commitment to promoting the health of vulnerable people." John (Juan) Luque, PhD, MPH is Associate Professor in the Institute of Public Health in the College of Pharmacy and Pharmaceutical Sciences at Florida A&M University in Tallahassee, Florida. Dr. Luque earned his MPH (epidemiology), and PhD (medical anthropology) from the University of South Florida, and postdoctoral training in behavioral oncology at Moffitt Cancer Center. He previously held faculty positions at the Medical University of South Carolina and Georgia Southern University, where he was a tenured Associate Professor. Dr. Luque’s research interests include community-based cancer education interventions to impact health disparities in medically underserved or racial/ethnic minority populations, knowledge and beliefs around cancer screening and prevention, and occupational safety practices among Hispanic farmworkers. This research has been supported by NIH and the National Institute for Occupational Safety and Health. With Levi Ross, he co-edited a special issue on cancer prevention and control and African Americans for the Journal of Cancer Education. Dr. Luque has served on NIH review panels and has published over 60 scientific papers in anthropology, medicine, and public health. He is currently a Fellow for the Society for Applied Anthropology and a former Executive Board Member of the Society for Medical Anthropology. Additional Information (FAMU website). Dr. Michael Ortiz is a fellow in pediatric hematology and oncology at Memorial Sloan Kettering Cancer Center and New York Presbyterian Weill Cornell Medical Center in New York City. Dr. Ortiz developed an interest in education during his pediatric residency at Children’s National Medical Center in Washington, DC. He has since received several awards for teaching and education, most notably the 2013 Ray E. Helfer Award for Innovation in Medical Education. As a member of the lab of Dr. Alex Kentsis, Dr. Ortiz’s current research leverages proteogenomics to rationally target therapy resistance in refractory embryonal sarcomas. Georgia Robins Sadler, BSN, MBA, PhD has been on the faculty of the UCSD School of Medicine since the late 70’s. She has been involved in multiple areas of research, all with a common focus on creating and testing ways to reduce the nation’s cancer disparities. Among the cancer education programs she has created and proven the efficacy of, are those based in African American beauty salons, Asian grocery stores, and churches, and as well as a nationwide cancer education program for the Deaf community and programs for those who serve them. She has also helped to address the nation’s cancer disparities by creating and testing programs to increase the diversity of members of the research and health care professions. She has been a member of the American Association for Cancer Education since the early 1980s, always attending annual meetings and routinely bringing a cohort of student scientists with her to present their research findings. She has received numerous grant awards from the National Cancer Institute and also served as a permanent member of the NCI’s Study Section G, and as its Chair for two years. She served as the president of the California Division of the American Cancer Society and has received numerous awards recognizing her professional and volunteer contributions, including AACE’s own Margaret Hay Edwards Award. Dr. Sheppard is Professor and Chair of the Department of Health Behavior and Policy in the School of Medicine at Virginia Commonwealth University. She also serves as Associate Director for Disparities Research in the Massey Cancer Center and co-leads the Cancer Prevention and Control Program. Prior to joining VCU, Dr. Sheppard was tenured at Georgetown University in Washington, DC, where she led studies focused on reducing inequities among cancer survivors through scholarship, teaching and service. Her team has been among the first to develop decision and communication support tools about systemic therapy for newly diagnosed African American, African-born, and Latino women. 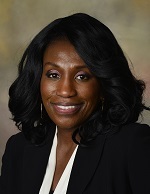 She has received funding from the National Institutes of Health, the American Cancer Society and other entities focused on adherence to adjuvant hormonal therapy, improving physical activity in African American survivors, and examining patient-reported factors that influence receipt of recommended systemic therapies. Her long-term goal is to identify modifiable factors that have potential to promote optimal survival for women with breast cancer. Dr. Williams earned a bachelor of science degree and a master's of public health at Florida A&M University. She earned a PhD in health behavior at the University of Alabama at Birmingham (UAB) School of Public Health. She completed her postdoctoral training in the UAB-VA Health Services, Outcomes, and Effectiveness Research training program, during which she also earned a master of science of public health in health outcomes. Dr. Williams’ research is focused on developing population-specific health behavior interventions for cancer prevention and control that will lead to a reduction in cancer disparities. Since 2009, Dr. Williams has been conducting research in Ghana, West Africa, that is focused on cervical cancer prevention. Dr. Williams is also currently working on a study that is aimed at investigating the nutrition environments of breast cancer survivors in the Deep South. She looks forward to collaborating with investigators and students across campus on research aimed at improving health outcomes and reducing health disparities. Kathleen Cullen Heneghan, is the Assistant Director of the Division of Education, Surgical Patient Education Program (SPEP) at the American College of Surgeons (ACS). Ms. Heneghan is responsible for the national assessment and development of patient education programs in surgery. She collaborates with surgical specialty and professional organizations to develop, implement and evaluate the surgical patient education resources including electronic, print and simulation. The Surgical Patient Education Program aims to support professionals with evidenced based education programs and empower patients with the skills and knowledge needed for full participation in care. AACE invites an employee of the National Cancer Institute (NCI) to serve as an ex-officio member of the AACE Executive Council. We are currently seeking a new NCI representative and will name the new ex-officio member as soon as that person is identified. As founding director of the nonprofit Center for Appalachia Research in Cancer Education (CARE), Dr. Melissa Thomas has served as Principal Investigator on a number of research studies aimed at reducing the burden of cancer through culturally-competent health education programs. Melissa also serves as Director of the Office of Health Equity and Sponsored Programs at the OhioHealth Research & Innovation Institute in Columbus, Ohio. As a first-generation college student, Melissa has dedicated her life to empowering communities in memory of her grandmother, Mazie, who died of cancer due to limited access to education and health care.